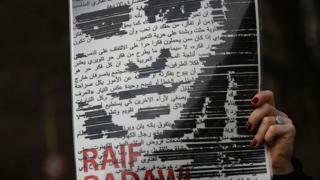 Supporters of jailed Saudi blogger Raif Badawi have expressed alarm at a report that he faces a new round of lashes. A Canadian foundation campaigning for his release said a source had told it the flogging could happen at any time. European Parliament President Martin Schulz, who gave Mr Badawi the Sakharov Prize for Freedom of Thought in 2015, said he was shocked and saddened. The 32 year old was sentenced in 2014 to 10 years in prison and 1,000 lashes for "insulting Islam" online. There was an international outcry after he received the first 50 lashes in public in January 2015, and he has not been flogged since. The Raif Badawi Foundation said in a statement that it had "received from a private source the sad news concerning the fact that the Saudi government will resume the lashing punishment". The source was the same who had warned about the first flogging session, the statement added. "Our understanding of the information is that another series of lashes punishment will take place this time inside the prison." Badawi's wife Ensaf Haidar, who fled to the Canadian province of Quebec with the couple's three children in 2012 following an attempt on her husband's life, told Deutsche Welle on Tuesday: "I was totally shocked by the news. I'm worried and scared that they'll carrying on whipping him." "I'm concerned about Raif's health, which is not good - either mentally or physically." Mrs Haidar added: "I really hope that Saudi Arabia will not go ahead and implement the sentence. I would hope that the Saudi authorities strip Raif of his citizenship and then deport him to Canada to be with us." Badawi established the Liberal Saudi Network, a now-closed online forum that sought to encourage debate on religious and political matters in Saudi Arabia, in 2008. In 2012, he was arrested in the city of Jeddah and charged with "insulting Islam through electronic channels" and "going beyond the realm of obedience". Later that year, a judge recommended that he also be tried for apostasy, which carries the death penalty, because Badawi had refused to "repent to God". But that was not pursued by prosecutors, and in 2013 Badawi was sentenced to seven years in prison and 600 lashes by a criminal court on the initial charges. In 2014, an appeals court upheld the conviction and increased the punishment to 10 years in prison and 1,000 public lashes. It also fined him 1m Saudi riyals ($267,000; £217,000) and banned him from any media work or foreign travel for 10 years after his release. Saudi Arabia's Supreme Court confirmed the sentences in June 2015.